This post was written in December 2011 and posted on another blog I have. It seemed like a good lead-in to what is to come. Mania was starting to rear its ugly head. Enjoy. Last week I pulled off something that was possibly worthy of the Guinness Book Of World Records. 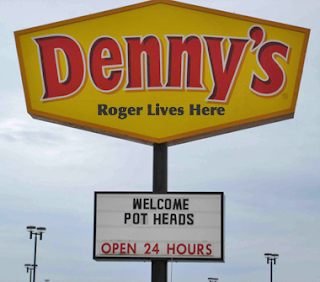 I don't even know if they have a category for this, but I spent 63 consecutive hours at Denny's. Yes, I'm gonna die. ... Seriously... I did. I have a lot I'm working on and I've run out of fingers and hands. So, I just don't sleep. I keep working and working and working. The insane part is that I'm really not making any money. I feel like I've been bailing water on the Titanic. No amount of effort will result in something positive. Life has become a relentless treadmill. I can't recall the time I had fun for more than a few minutes. I do amuse myself. No one else around to participate. Me, the computer and my mind, which twists in circles and bounces from one end of the spectrum to the other. Everyone says, "You know that ain't healthy." Duh! Oh, I can feel my body breaking. But I'm driven to drive myself out of here. You can't knock me for lack of effort. I'm just trying to march through the holidays and act like they never existed. It's times like these that I wonder why I quit drinking. It just wasn't fun anymore. But then again, few things are. It's days like these that I miss the road, too. Comics are a sick lot, but there were laughs. It takes a comic to make a comic laugh. Sad songs on iTunes don't phase me. They're part of the norm. I'm more than halfway there, right now. Another couple thousand words and I'll be done for a short while, then back at it. I am ...seriously... fucked up... but that's the norm.